Pressing Through investigates the multi- faceted practice of printmaking, while accompanying the second edition of the Small Press Fair, SPF’17. 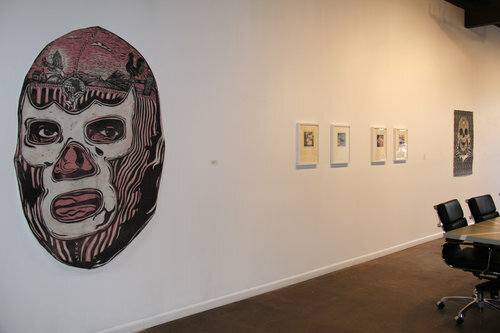 The exhibited artists explore their unique personal histories, current social influences and societal pressures through the lens of contemporary printmaking. Prints, known as the most democratic art form, are meant to exist in an edition of multiples. The multiple is not bound by geography and therefore broadens the potential of the printmakers work, allowing their message to be experienced by several audiences in different places, all at the same time. The selected works echo the recursive and cyclical nature of the printmaking process, showcasing the layer, reduction and transformation of imagery. Pressing Through celebrates both the tradition of printmaking and its contemporary applications in part by highlighting its diversity in process and execution.